Most of you know that I mainly use samples and miniatures when preparing my Reviews. At the request of many of my readers I give preference to more recent expressions. As a result, my backlog of older samples has increased quite a bit. To do justice to those samples I will review them in the format of Specials. These specials will deal with a specific distillery like today or specific bottlers, countries or regions. The reviews in these Specials will concentrate more on the Whisky and won't touch too much details about distilleries, maturation etc. I do hope you will like these Specials just as much as my regular reviews and I look forward to your reactions and suggestions. In this special I will review three random Bowmore Single Malts from Islay. Enjoy! Buying Advice: 👎 Young, Thin and Weak. Diet Bowmore! Quite Light, Young, Sweet, Salty and a bit Hot. It is recognisable as a Bowmore but it's living dangerously on the Thin side of School Street (Bowmore's location on Islay). Some Sour, Green and Coastal notes as well. The notorious Islay Peat & Smoke are there but not in a very pronounced way. Sweet Barley, Burnt Toast, Honey, Caramel, Peat, Cold Smoke, Brine, A mix of Straw and Cow Manure, Shell Fish, Lemon, Orange, Green Apple, Floral Tea and Tobacco. Vanilla, Wet Sand, Tar, Ashes, Rubber, Burnt Paper or Cardboard, Iodine, Green Vegetables, Pineapple and some other Fruit I can't quite narrow down, (Berries perhaps), Dusty Old Book shelves, Mint and Leather. Young, Thin, Sharp and Sugary Sweet. Salty, Sour and Bitter towards the Dry end. A clear Metallic off-note I could live without. Malted Barley, Burnt Toast, Caramel, Toffee, Peat/Wet Earth, Cold Smoke, Brine, Ashes, Tar, Sugared Floral Tea, Licorice, Tart Apple, Grapefruit, Tobacco, Mint, Pepper and Strawberries. Vanilla, Dough, Burnt Paper/Cardboard, Orange, Honey, Rubber and Leather. Short, Thin and Sugary Sweet. Dry and Briny towards the end. A light Metallic Off-Note. It doesn't really invite me to take another sip. I find Malted Cereals, Buttered Toast, Brine, Ashes, Peat, Cold Smoke, Iodine, Tar, Lemon, Bitter Licorice, Sugared Tea, Rubber, Burnt Paper/Cardboard, Honey, Caramel, Pepper Green Apple and Leather. Added Water kills this Legend. Sort of okay although the experience is similar to tasting a not too expensive Blended Scotch that contains Islay Malt. Bowmore is the oldest Distillery on Islay and was founded in 1779 by David Simpson. It changed hands a couple of times along the years but since 1994 the Japanese Suntory group controls Bowmore. Bowmore still malts around 30% of the Barley on their premises. They currently produce around 1,6 million liters of Alcohol. The core range includes the NAS # 1, the 12, the 15 Darkest, the 18 and 25 Years. 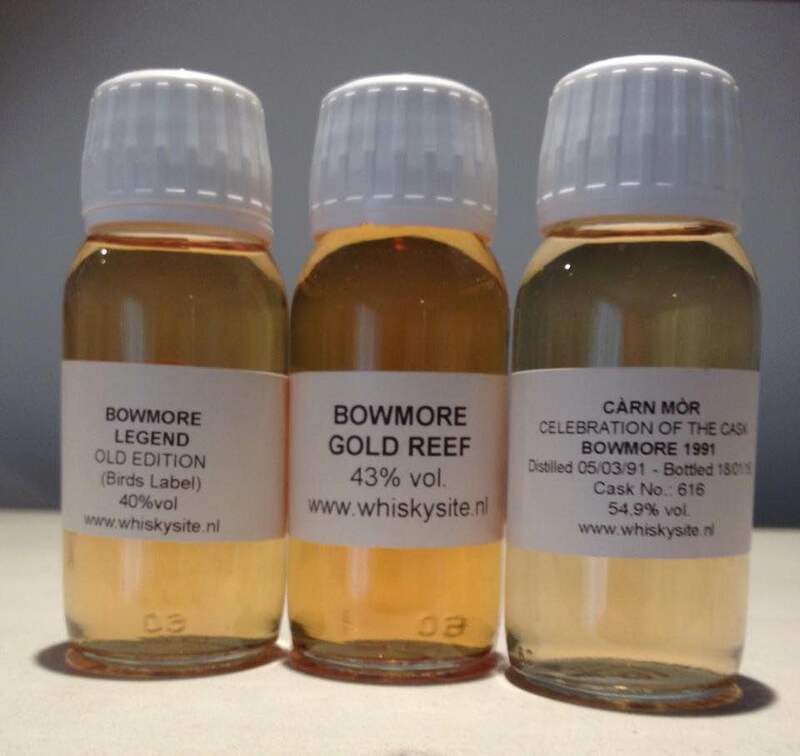 Some of the Bowmore Spirit is used in Blends like Rob Roy and Black Bottle. We visited the distillery in 2014 and 2017. I really like the Malting Floor. Nice Shop and Visitor-Centre. Certainly well-worth the visit. 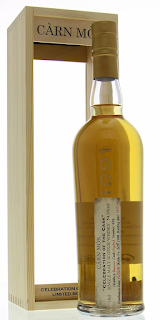 A subsequent edition of the Legend with a more traditional Bowmore label was released after the Old Edition (Birds Label) was discontinued. It is pleasantly priced at around US$ 40,-- but I believe it has been discontinued as well as Bowmore has recently renewed its core range and Travel Retail expressions. I can't say I fell in love with this Diet Bowmore. It's very Weak and Thin and misses everything that a good Bowmore offers. This Legend will be hard to find but I wouldn't bother trying if I were you. The nice label with flying seagulls is the only attractive part of this Bowmore. Next please! Buying Advice: 😐 Okay but nothing special. Reasonable P/Q ratio. Young, Light and a little Edgy but not unpleasant.A combination of Bitter-Sweet, Sour, Mineral, Coastal and Musty notes. 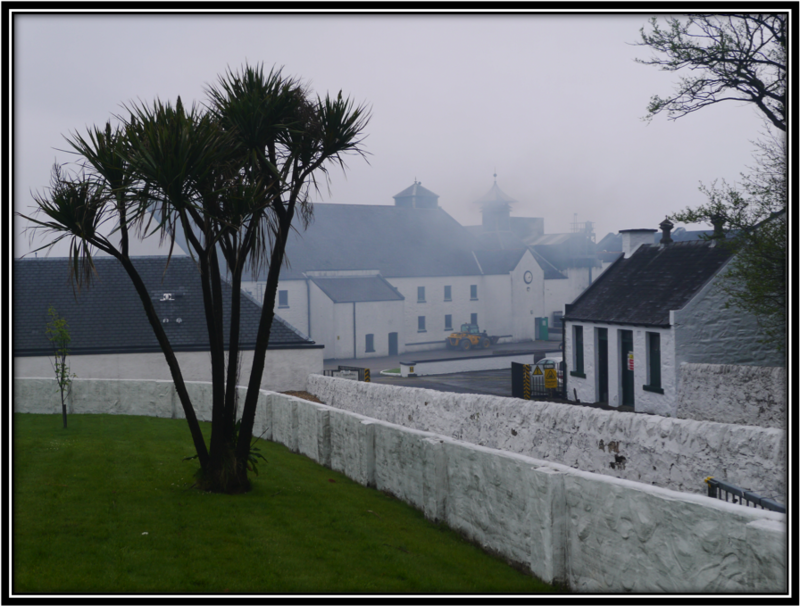 The Smoke and Islay Peat are merely an afterthought. I get something Metallic as well but it doesn't develop into an Off-Note. I do not find any substantial Sherry-Wood influence. Toasted Barley, Burnt Toast & Salted Butter, Caramel, Vanilla, Straw, Mandarin, Lemon, Peach, Apple, Bounty Candy Bars, Wet Rocks, Vegetables, Mint, Honey and Leather. Earthy Peat, Cold Smoke, Nectarine, Apricot, Banana, Wax, Pepper, Freshly Cut Wood and some Red Fruit (Raspberry). Young, Edgy & Thin despite the 43% ABV. A mixture of Bitter-Sweet, Sour and Earthy notes. A touch of Hospital Air as well. Quite Dry actually. Sweet Barley, Salty Caramel, Vanilla, Heather-Honey, Earthy Peat, Cold Smoke Bounty Bars, Banana, Lemon, Mandarin, Kiwi, Iodine, Tar, Ashes, Mint, Pepper, Chocolate and Leather. Sugared Tea, Nectarine, Charred Oak, Bacon, Vegetable Oil, Herbs, Red Fruit, Ginger and Cloves. Middle-Long, a little Sharp and Bitter-Sweet. The Bitterness increases strongly towards the rather Dry end. A few Sour, Metallic and Mineral notes as well. I find Toasted Barley, Salty Caramel, Vanilla, Dry Earth, Hospital, Tar, Ashes, Heather-Honey, Herbs, Mandarin, Lemon, slightly Sour Grapes, Bounty Bars, Chocolate, Espresso, Leather, Licorice, Pepper, Cloves and Ginger. Added Water does not benefit the Gold Reef. It becomes too Thin. Good. Nothing Special Though. Quite Bitter Finish. The Gold Reef was released for the Travel Retail Market in 2014 as part of a trilogy that also includes the Black Rock and the White Sands. In the meantime the Gold Reef is available elsewhere as well. It is named after the reef in Loch Indaal in front of the distillery. I think it has been discontinued as well in the meantime as Bowmore has recently renewed its core range and Travel Retail expressions. 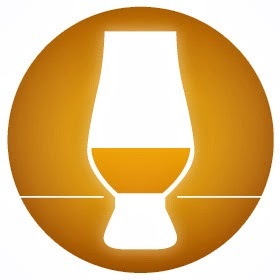 The Gold Reef is not a bad Single Malt and the P/Q ratio is reasonable although we're talking about a young Whisky. Probably something around 7-8 years. But it does not convince either. It's still on the Light side despite the 43% ABV. It would have been better at 46% but that's crying over spilled Malt. Aromas and Flavours are all quite Mainstream and the Peat/Smoke is neatly diluted so as not to scare off Travel retail buyers. 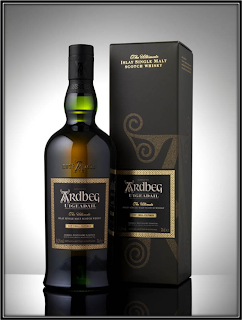 At its best it's an introduction to Islay Whisky. 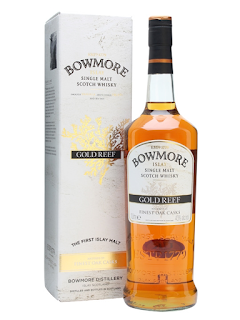 At its worst it's a plain, simple and Mainstream Bowmore without any depth or complexity. Let's find out if an Indie bottler can save the day! Buying Advice: 😋Delicious mature Bowmore. If you can afford it, buy it! That's much better! Nicely matured Bowmore. The ABV is quite high so make sure to give this Malt sufficient airtime. And avoid to stick your nose in the middle of the glass. Always nose on the rim of the glass. That way, you will be able to pick up the Fruit Aromas a lot easier. On the Nose, this Bowmore is Sweet with lots of Grass and Citrus. The coastal Islay Aromas are present as well but they remain discretely but pleasantly in the background. Good balance on the Nose. Toasted Barley, Buttered Toast, Earthy Peat, Vanilla, Grass, Bacon, Pear, Green Apple, Citrus, Charred Oak, Ginger, Cinnamon and Mint. Smoked Fish and Shell Fish, Dusty Old Books, Heather-Honey, Salted Peanuts, Tar, Gasoline, Banana, Pineapple, Gooseberries, Salty Caramel and Nutmeg. The best part of this Bowmore! I simply love the taste of mature Islay Malt. The typical Islay Flavours weave their soft spell around the other components in a way you won't find in other types of Whisky. 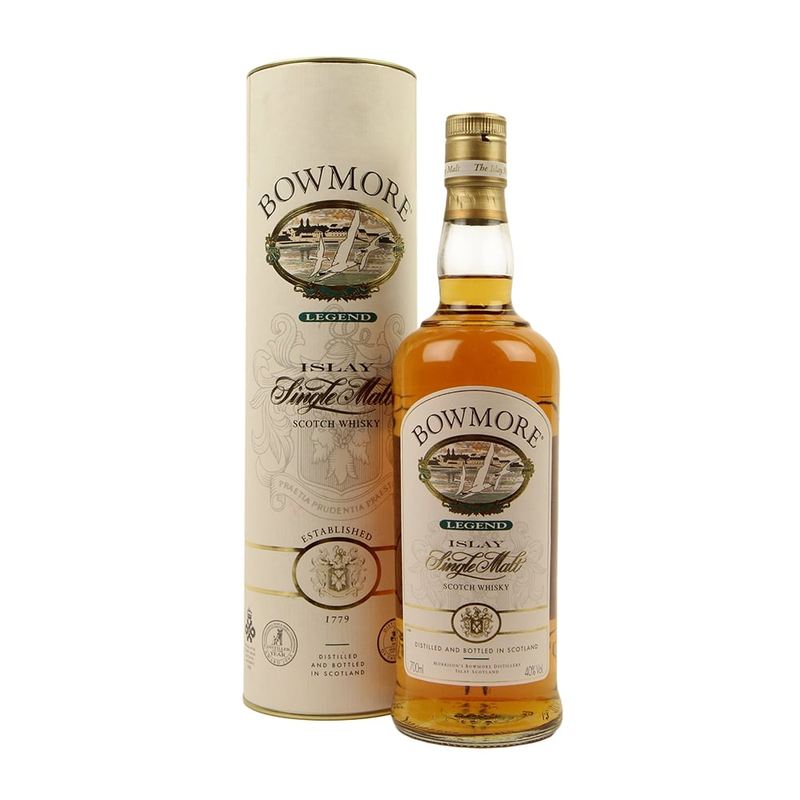 On the Palate this Bowmore is Fruity and Spicy with a few Sour notes as well for balance. Only a very light Oak Bitterness. I could drink a glass of this every day! If I could afford it of course. Which I can't! Toasted Barley, Buttered Toast, Salted Caramel, Vanilla, Green Apple, Orange, Lemon, Grapefruit, Cold Smoke, Coastal Peat, Smoked Fish, Shell Fish & Bacon, Cinnamon, Nutmeg, Pepper and Menthol. Brown Sugar, Heather-Honey, Pear, Dusty Track, Banana, Pineapple, Licorice & Leather. Good Length. A combo of Sweet, Sour, Coastal, Fruity and Spicy notes. Only a very light Bitterness towards the Medium-Dry end. Good stuff! I find Toasted Barley, Buttered Toast, Salted Caramel, Brine, Coastal Peat, Cold Smoke, Tar, Ashes, Bacon, BBQ Pork, Vanilla, Orange, Lemon, Gooseberry, Grapefruit, Oak, Green Apple, Pear, Pepper, Nutmeg, Ginger, Menthol and a little Chocolate and Licorice. It helps to add a few (4-5) drops of Water. The Alcohol retreats and the Fruity and Floral notes on the Nose develop. I also get some Peach now and the Honey shines. A bit of Perfume (Violets) as well. The Palate and Finish basically stay the same but it's easier to enjoy this Bowmore with a little Water. This nicely matured Bowmore bottled by Carn Mor did save the day after all. There's something magical about mature Islay Malts that never fails to impress me. 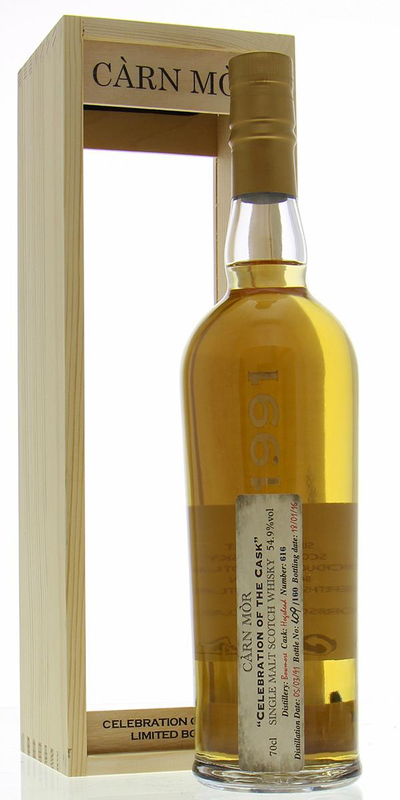 Young Islay is nice but Peat and Smoke are very prominent. With time, the coastal elements loose their youthful strength and cast their mature spell over the other Aroma and Flavour components. A priceless combination. A mature Islay can't be cheap of course but I prefer one bottle of this over ten or twenty bottles of Legend or Gold Reef. The industry might tell you otherwise but for me only time and a good cask produce a truly delicious Whisky. Well done Carn Mor. You have just shown us that there's nothing wrong with Bowmore Spirit. It all depends what you do with it! Cheers!